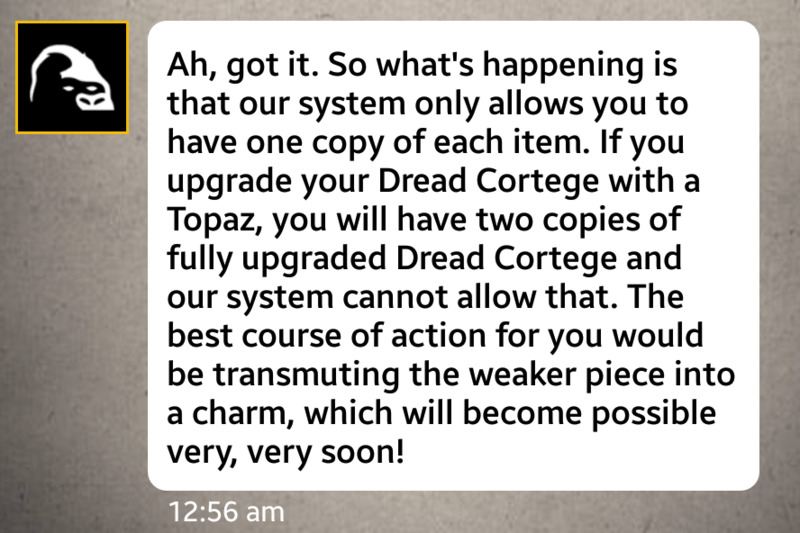 Re: New upgradable and transmutable equipment! The helmets from a few events ago? Exact same issue here, three prior were fine, just the Topaz that has presented the error. For those of you that can't upgrade your 2nd "Black Friday" equipment set with the Topaz. This is why. Reckon there is no workaround unless ATA increases the limit. Ecstasy wrote: For those of you that can't upgrade your 2nd "Black Friday" equipment set with the Topaz. This is why. Reckon there is no workaround unless ATA increases the limit. Yes, when we will be able to transmute the previous helmets?